NEW YORK, NY--(Marketwired - Feb 2, 2015) - Staffing 360 Solutions, Inc. (OTCQB: STAF), a public company executing a global buy-and-build strategy through the acquisition of staffing organizations with operations in the US and Europe, today announced the availability of the transcript of its earnings conference call for the fiscal quarter ended November 30, 2014, which was held on January 21, 2015. During the conference call Brendan Flood, Staffing 360's Executive Chairman, stated, "We are very satisfied with the incredible growth over the past year, and we believe that we're firmly on the path to achieving our stated objectives." Mr. Flood continued, "We are fully committed to becoming profitable as soon as possible, and we are extremely pleased to report positive Adjusted EBITDA ahead of schedule. As mentioned on our previous calls, our expectation was that we would move into profitability on an Adjusted EBITDA basis during fiscal 2015, which ends May 31, 2015. So, to achieve this milestone two quarters early is a significant achievement for us, and is a testament to all of our staff and their operations." Throughout the conference call Staffing 360 Solutions' management talked about the Company's various acquisitions, its growth strategy, the team's Pathway to Profitability, and full detail surrounding the financial results for the fiscal quarter ended November 30, 2014. The Company uses financial measures which are not calculated and presented in accordance with U.S. generally accepted accounting principles ("GAAP") in evaluating its financial and operational decision making regarding potential acquisitions, as well as a means to evaluate period-to period comparison. The Company presents these non-GAAP financial measures because it believes them to be an important supplemental measure of performance that is commonly used by securities analysts, investors and other interested parties in the evaluation of companies in our industry. We refer you to the reconciliations above. The Company defines Adjusted EBITDA as earnings (or loss) from continuing operations before interest expense, income taxes, depreciation and amortization, and amortization of non-cash stock-based compensation, non-recurring acquisition and restructuring expenses and the goodwill impairment charges. The Company excludes stock-based compensation because it is non-cash in nature. Certain matters discussed within this press release are forward-looking statements including, but not limited to the timing and ability to enter into any additional acquisitions, as well as the size of future revenue. Although Staffing 360 Solutions, Inc. believes the expectations reflected in such forward-looking statements are based on reasonable assumptions, it can give no assurance that its expectations will be attained. Specifically, in order for the Company to achieve annualized revenues of $300 million, the Company will need to successfully raise sufficient capital, to consummate additional target acquisitions, successfully integrate any newly acquired companies, organically grow its business, successfully defend current and any potential future litigation, as well as various additional contingencies, many of which are unknown at this time and generally out of the Company's control. The Company can give no assurance that the Company will be able to achieve these objectives. Staffing 360 Solutions does not undertake any duty to update any statements contained herein (including any forward-looking statements), except as required by law. Factors that could cause actual results to differ materially from expectations include general industry considerations, regulatory changes, changes in local or national economic conditions and other risks detailed from time to time in Staffing 360 Solutions' reports filed with the SEC, including quarterly reports on Form 10-Q, reports on Form 8-K and annual reports on Form 10-K. 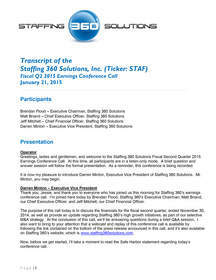 Staffing 360 Solutions, Inc. announced the availability of the transcript of its earnings conference call for the fiscal quarter ended November 30, 2014, which was held on January 21, 2015.